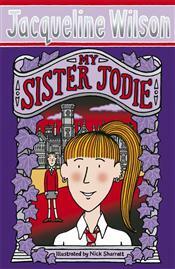 This week’s Recommended Read comes from Eamee Boden, our Wirral Apprentice for Get Into Reading, whose growing love of reading has been encouraged by Jacqueline Wilson’s moving story of love and loss, My Sister Jodie. Imagine having a sister but she is more like your best friend, you go everywhere with her and you do everything together and when things are getting you down she’ll always be there for you!! Well these two sisters Jodie and Pearl are just like that. They move to a private a school because the parents aren’t happy with their level of education that they are receiving at the public school so they decide to accept their new jobs at Melchester Private school, and they move away to begin their new lives, with their dad as the care taker and their mum as the new head cook of the school. But with the girls finding it particularly difficult to settle in especially Jodie who goes even more wilder and starts acting up at school, they’re starting to regret moving. Pearl has always been the quiet one who sits in the corner and reads books and has hardly any friends and Jodie has always been the wackier and wilder one who hangs out with her friends till all hours of the morning. But with these sisters it doesn’t matter what their personalities are like they always have time each other. But things are different at Melchester, Pearl makes a whole ton of friends and poor Jodie just hangs round by herself and is taunted by all the ‘posh’ kids, this is since coming to Melchester. At Melchester they meet a teacher called Mrs Wilberforce who is wheelchair-bound, after falling down the stairs of her tower she broke her neck and is paralysed from the waist down. Mrs Wilberforce has a special place in her heart for Pearl and tells her what had happened for her to be in a wheelchair and warns Pearl never to go up to the tower. Pearl of course tells her sister everything and tells Jodie what had happened to Mrs Wilberforce. Jodie who doesn’t listen to what ever is said, even if it’s for her own safety, she finds a way of nabbing off with her dad’s bunch of keys and gets into the tower. Everything seems to be fine, nothing serious, so Jodie continued to wander off to the tower every evening. Tragedy strikes, when there is a fireworks display to mark bonfire night. Jodie asks her dad what time the fireworks are due to be let off and then she disappears. Assuming she would be back in time for the display, Pearl doesn’t worry about her. But during the display just after 7:30 Jodie is in the window of the tower and can be seen by everyone on the ground. She’s dressed up as a ghost and scares all the ‘littlies’. She then sees that they are genuinely scared of this ‘ghost’ and start running around in a mad panic, she tries to convince them that the ghost is really her and she leans out of the window a bit too much and loses her balance on her really high red heeled shoes and topples out of the window and lands with a thud on the ground; she died. The parents and Pearl decide to move away to make a brand new start (especially with the new baby on the way) after the funeral. Once May was born Pearl writes her a story telling her all about Jodie and what kind of person she was like. She says to her new baby sister “I’ll never ever be such a great sister as Jodie. She’s your sister too, May, and she always will be.” Pearl looks after her sister the way Jodie looked after her. I would recommend this book for the age 12-15. It’s such a good book but with sadness of some parts of it I don’t think it would be right for a younger age. It had a range of different emotions and it explores the way sisters and families pull together through such hard times. This was my first book that I have read since starting at The Reader Organisation by myself, as I didn’t really read that much. That bit sounds a bit childish but reading hasn’t always been my strong point but now it’s making its way back into my life and I’m really getting in to reading and starting to love reading. I adore Jacqueline wilson her characters always seem to be like people you meet in every day life , i think she can appeal to all ages as just read her autobiography to an old lady or should I say more mature in mind which in my case is not to difficult to do! Alot of BORING people would not think of reading such books but have ago and you may surprise yourself and find you really enjoy it ! Sounds like a wonderful but sad book, I’ll definitely recommend it to some of the young people I read with. I loved reading ‘Lily Alone’ with a 10yr old recently – Jacqueline Wilson is greaat at hitting the hard issues in a fun way.